UNITED NATIONS, November 29 -- Medicine and mosquito nets given for free by the UN system to the government of Sierra Leone have reappeared for sale for profit in Free Town. The abuse is widespread. Inner City Press on November 25 asked UN spokesperson Michele Montas if Ban Ki-moon or his envoy on malaria Ray Chambers have any comment, any plans to address this re-sale of UN aid. First let's see if it's true, Ms Montas said. But it has been captured on film, by the BBC's Panorama program, summarized here. "Cotrimoxazole is on the essential medicines list of most countries and is one of the products in highest demand from UNICEF. It is a well-tolerated and cost-effective life-saving intervention for children living with HIV or who have been exposed to HIV. To help save the lives of children in Sierra Leone, UNICEF provides supplies of nets and drugs to the Government for distribution. "It is unrealistic to expect that all of the drugs and nets we provide will be used for the purpose for which they are intended... Where we have information about large-scale leakage from our programmes, we investigate and take action." But what action has been taken in this case? Contrast this well-crafted answer, though, with the underlying report, here. There is a need for the head of the UN system, Ban Ki-moon or at least his Malaria Envoy Ray Chambers, to speak and act on the resale for profit of UNICEF-granted drugs in Sierra Leone. A/63/474, that '[a]t UNICEF, the Board observed that some National Committees were retaining up to 100 per cent of the gross proceeds from the sale of greeting card products even though rule 9.04 of the special supplement to the UNICEF Financial Regulations and Rules states that they may be authorized to retain only up to 25 per cent of such sales. The Advisory Committee concurs with the Board that UNICEF should ensure that the 25 per cent retention limit is applied and that, if necessary, UNICEF should evaluate and formalize any exceptions to the rule.'" Hi Matthew, Here's an answer re the Greeting Cards. "In 2007, the UNICEF greeting card business generated sales of $ 156 million and made a net contribution to UNICEF programmes of $ 61 million, a healthy 39% operating margin, comparing favourably to the industry average of 4% to 8%. As with all consumer-product businesses, there are costs associated with the sale of UNICEF greeting cards. These include direct selling and marketing costs, production and manufacturing, logistics, and distribution. "In some markets, UNICEF has recently faced increased competitive pressure coupled with market contraction. This has resulted in lower than expected sales and higher than expected selling costs. In these markets, UNICEF and the relevant National Committees are presently reviewing alternative distribution models to improve the cost to sales ratio and improved levels of profitability." Despite UNICEF's spokesman's always erudite answers, one wonders if "the relevant National Committees" include UNICEF Germany, faced earlier this year with scandal which UNICEF also minimized, at least initially. We await Ban Ki-moon's views and action on the sale for profit of UNICEF-given drugs in Sierra Leone. Working for children is laudable, but oversight is needed. This can appear to be lacking at UNICEF, witness not only the above but also the UN's reticence to openly criticize UNICEF's chief's granting of the UN's North Lawn to Madonna and a Kabbalah-affiliated charity earlier this year. 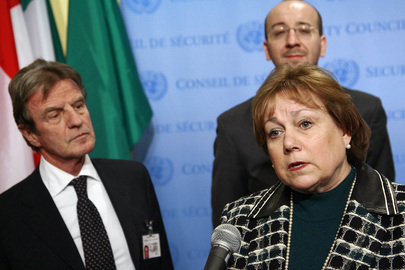 UNICEF's chief has yet to hold a press conference with Q&A in UN headquarters since then.